After completing his previous projects Postcards (where he wrote 52 songs in 52 weeks) and Ghostwriting (where he offered his songwriting to tell other peoples stories), Jens Lekman came up with a new idea. He asked fellow Swedish songwriter Annika Norlin (Hello Saferide, Säkert!) to join him. >span class="None"> Before starting, they did some research on famous letter writing in literature. They were struck by how you usually have to be dead and declared a genius for your correspondence to be published. That’s sad, they thought, and decided this would be great to do while they were still alive. One letter each month throughout the year - in total, six songs for Jens and six for Annika. Only one instrument could be used for each song. This was TO help them focus on the songs/letters instead of the production. 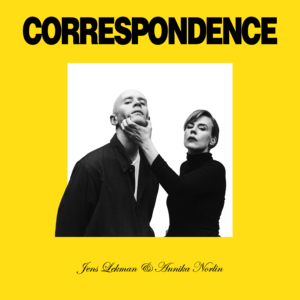 Correspondence gave Jens and Annika an outlet for more spontaneous ideas, and they decided to stay under the radar by only releasing the songs on the Correspondence website, and a Spotify playlist. Most of the time they forgot that anyone else could hear the songs, and they turned out very personal. But looking back at 2018, maybe most of the personal things they wrote about - exhaustion, longing for human connection, harassment, climate change anxiety - summed up 2018 at a larger level as well.